Transferring data from one computer to another shouldn’t be a pain – there are multiple ways one can transfer data quickly. The number and size of files and types of computers will help you discover which approach fits best for you. We have explained below some methods which will ease the process of transferring data from one computer to another. This method is extensively opted for transferring data. Use a USB flash drive to copy data from one computer and paste it on the other computer.To transfer huge data or large files, you must always choose External Hard Drive over Flash Drive. Check the USB ports of both computers. If both the PCs have USB 3.o port, you may have to consider spending on one of the fastest flash drives around. When you have a ton of data to transfer, speed matters. You can do it instantly. Just look for an eSATA port or SATA slot in the computer from which data has to be moved. If you find it, detach the hard drive from the older computer and connect it to the other computer. The drive will appear as a separate drive on the targeted PC. Moving data via SATA is faster than USB transfer. If you are a Windows user and often work with other Windows PC, use an Easy Transfer USB cable. USB cable allows you to connect two Windows computers with a USB-to-USB cable connection. The data movement becomes easier if USB 3.0 is available on both PCs. Apple has its own proprietary port, Thunderbolt that permits you to create a daisy chain and transfer files between Macs. So, use a Thunderbolt cable to transfer data from one Mac to another Mac. Utilize an Ethernet cable to build a Local Area Network without a router. You need to ensure that it is a crossover Ethernet cable, i.e. the color patterns on one end are not similar to the other. After setting up network sharing on both PCs, you are good to go. 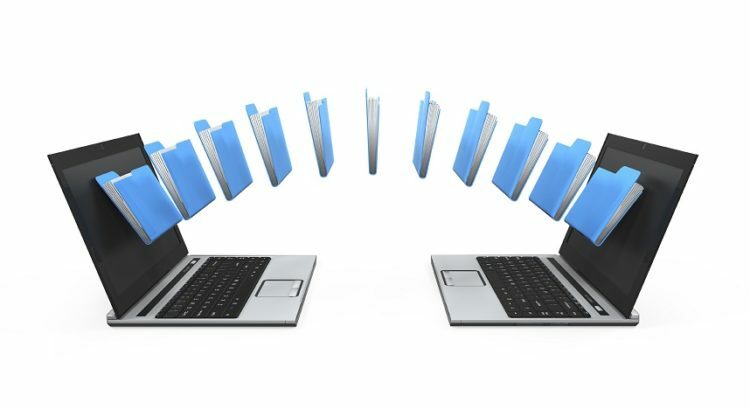 To share data from one computer to another computer on the same Wi-Fi network, you can take advantage of some simple software. Using software is an easier approach to transfer the data without setting up a home network and is ideal for temporary networks. There are various softwares to share large file seamlessly from one PC to other PC over Wi-Fi like Send Anywhere, Snapdrop, and Filedrop. All you need to do is drag and drop the required files to the software, and it will appear on the other computer. The setup of software is pretty simple and these applications work for both Mac OS and Windows. If you are moving data from one computer to another, you may not use the other PC. You may have to install a new hard drive to replace the old one. How do you get the old data back? Hard Disk Drive (HDD) and Solid State Drives (SSD) utilize standard SATA cables to connect with motherboard. If you have eSATA or SATA port, associate your old hard drive there. The operating system will identify it as a new drive. It is the fastest way to transfer the data. Locating a spare SATA port on a laptop is difficult. You can make the data transfer easier with a simple SATA to USB converter, such as USB 3.o to SATA adapter. You may feel the need to convert your old hard drive into an external storage. Buying an external case for old hard drive will permit you to copy all data from it, and afterward, you can use it as a portable external storage.